Some of you may have tried Fedora, but found it to be a bit difficult to shape and bend to your needs or desires and went looking elsewhere. 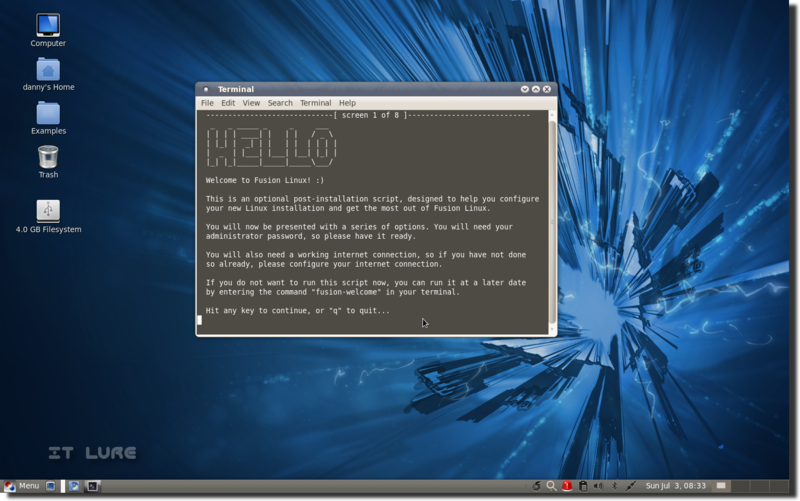 For you, and for new users of Linux, I present... Fusion Linux, an OS that is based on Fedora, but is packed with all kinds of goodies to make your e-life more pleasant and hassle-free. The "packed with goodies" perk comes with the obvious downsize of disc image dimensions, but nowadays, that hurdle is easily hopped over with the help of super cheap DVD-RW drives or unetbootin + USB flash drive. I chose the latter for Fusion's 1709 MBs worth of ISO data. The live "preview" loaded pretty fast and I was welcomed by a set of pre-activated desktop effects (powered by nouveau), like wobbly windows, Scale or Desktop Cube. After spending a worrying amount of time playing with said wobbly windows, I snapped out of it and double clicked the Install icon. Much can be said about Fedora's installer, but one can't deny its sheer speed and, most importantly, user-friendliness. 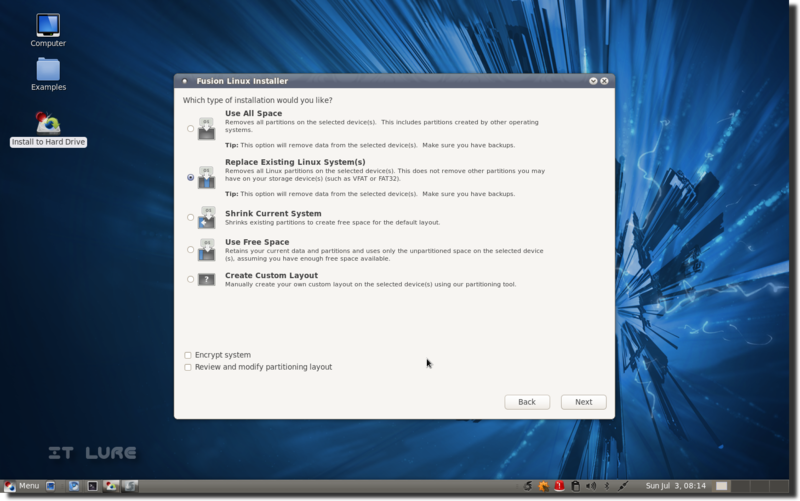 One particular component makes me love it: the option of replacing existing Linux partitions, an important timesaver, especially for distro-hoppers. The timezone picker, though quite old, still does its job right. 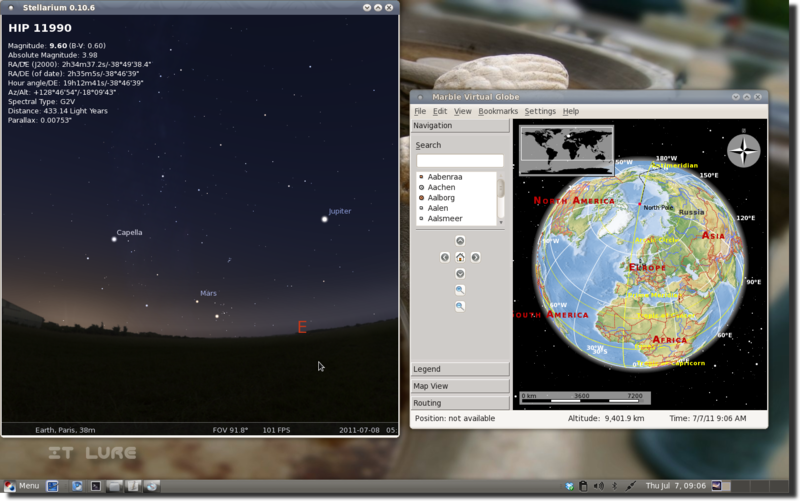 Plus, I prefer the photo-realistic map; you can learn geography while you're at it! Uuuu, look at that huge desert! Even though I knew the installation will be over in a blink of an eye, I decided to play a quick game of Blob Wars: Metal Blob Solid. One word: awesomeness! Look at that mean-looking, bandana-wearing, yellow blob! You can't touch this, Chuck Norris, you just can't! 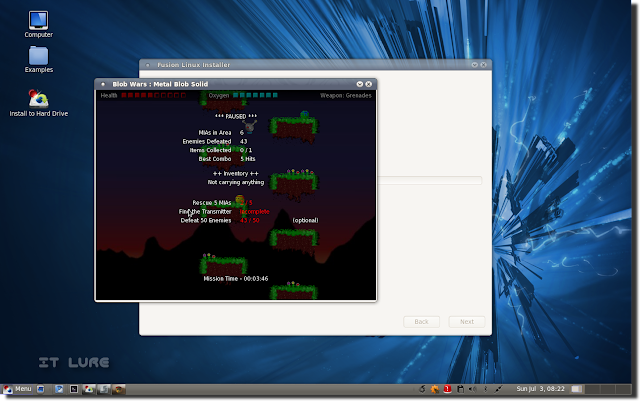 So, 1709 MBs of data, a running game and still, the installation was done in approximately 7 minutes. Woohoo! 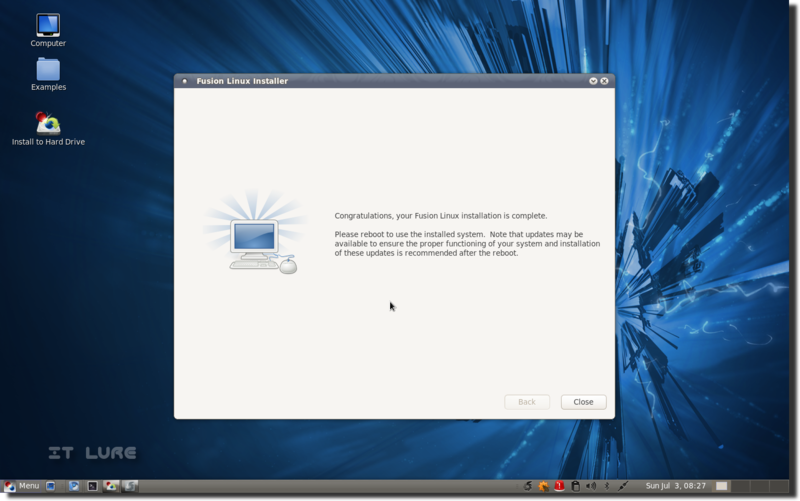 What I don't like is that the user creation is placed after the first boot, and not during the actual install. 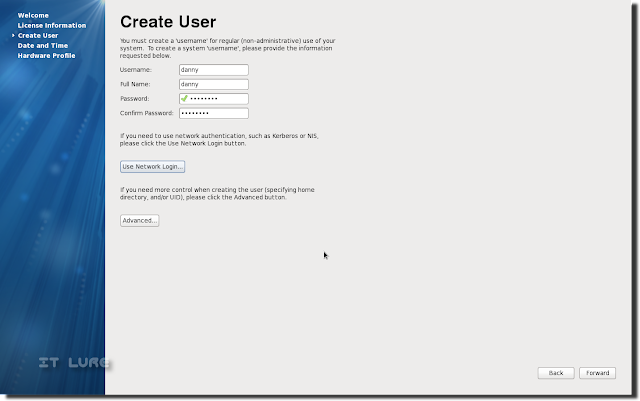 Firing up Fusion is not lightning fast (the after-login section takes quite a bit of time), but is fast enough. You are greeted by a Terminal Wizard (not a Wizard that is about to die - wizards never die) that reminded me of Pardus' way prettier one. You are asked to bring Fusion up to date, install Skype, setup SUDO for your user, install Redshift (it auto-adjusts the color temperature of your monitor to be as easy on the eyes as possible, at any particular time during the day), run the Dropbox installer, and choose one of 3 wallpapers: Fusion Linux wallpaper, Fedora wallpaper and Special surprise wallpaper. I obviously chose the third option (I wonder who would NOT choose that), aaaand I won't tell you what it is! Thank me for not ruining it! 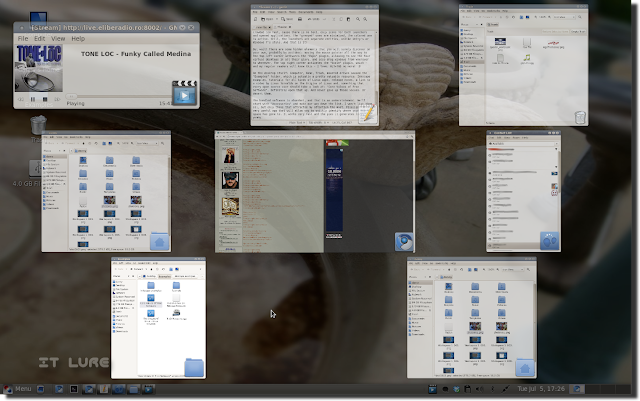 The desktop presents itself with a stylish gray (or grey; or graey) panel at the bottom, which is surprisingly small. 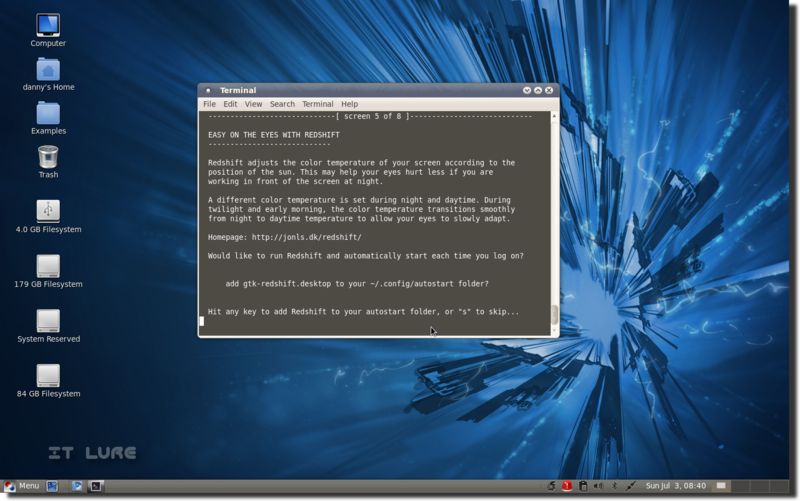 Actually, it's as small as it should be, but I've grown accustomed to the current abominations that started to plague popular Linux distros. You have a solid implementation of mintMenu, followed by the forever-useful "show desktop" button (which, during a later reboot, failed to auto-start), two launchers: Chromium and Terminal, the application switcher, notification area, date/time and workspace switcher. 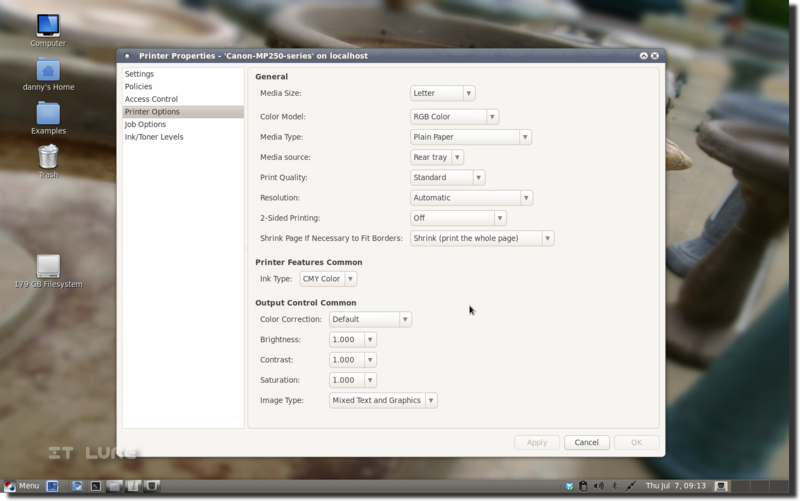 The taskbar won't get crowded too fast, cause there is no text, only icons for both launchers and opened applications. The "greayed" ones are minimized, the colored one is active. Still, the launchers are separate entities, unlike Unity's or Windows 7's style. And that is it! On the desktop itself: Computer, Home, Trash, mounted drives and the "Examples" folder, which is actually a pretty valuable resource: Inkscape art, tutorials for all kinds of Linux apps, release notes, a link to a video by Linus Torvalds on The Origins of Linux and, something that every open source user should take a look at: "Core Values of Free Software". Definitely open that up. And never give up those values. Or desert them. The bundled software is plenty, and that is an understatement. We'll start with "Accessories" and make our way down the list. I won't list them all, but only those that attracted my attention the most. 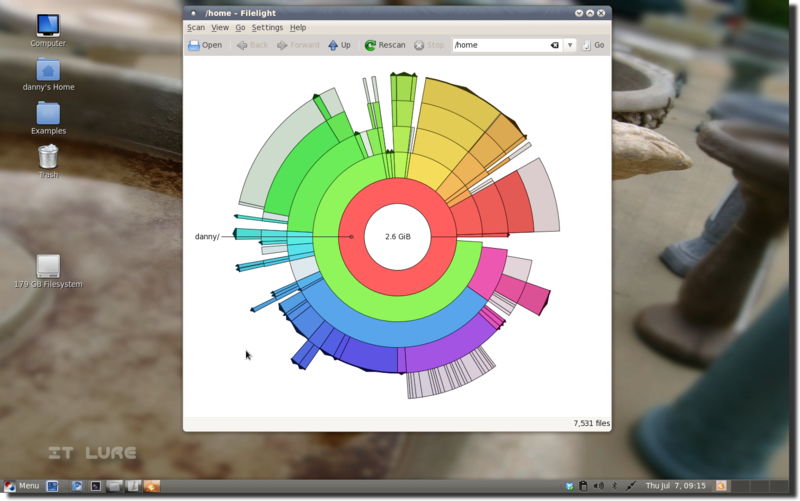 Filelight is a very useful app that will allow you to quickly identify where your HDD space has gone to. 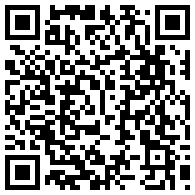 It works very fast and the pies it generates look yummy. At first, I didn't want to mention gedit, because it's basically everywhere, but a missing component caught my attention: there are no dictionaries pre-installed, so the spellcheck plugin, though enabled, will not work. And yes, no dictionary means LibreOffice is also spellcheckless. Bummer! GNOME Do is an old favorite of mine. If you are willing to spend some time exploring its capabilities, I guarantee this super-launcher will increase your productivity. Krusader offers a pretty solid dual-pane file manager that can be enhanced by various plugins. Kfloppy is, let's be honest, a bit of a space waster. Yes, some may still use floppies, but most users and machines are way past that era. 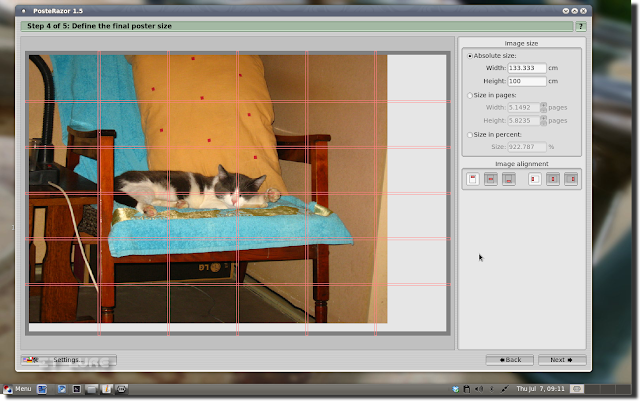 Shutter provides a complex (yet easy to use) way of taking, managing and editing desktop screenshots. 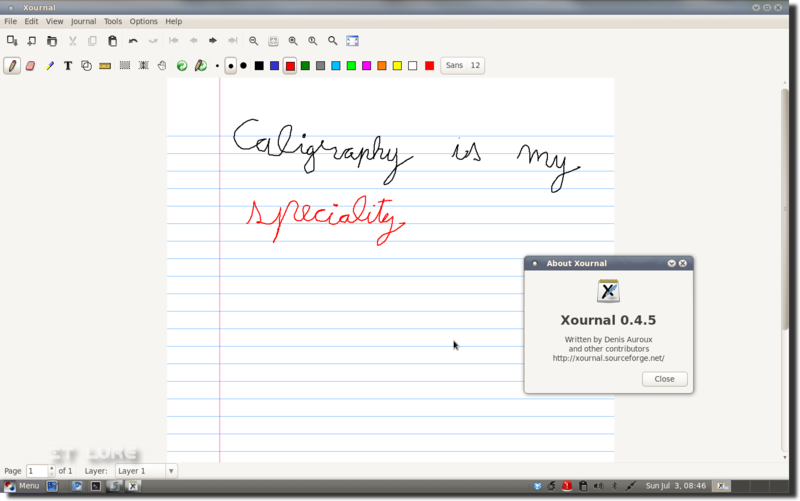 Xournal lets you excercise your caligraphy skills on a virtual old-school notebook. The Education category brings two great additions to the table: Marble (virtual atlas) and Stellarium (which was actually featured in one of those awesome sixtysymbols videos on youtube). No less than 16 games fill the "Games" section and you can clearly tell the developers are avid fans of top-down space shooters. 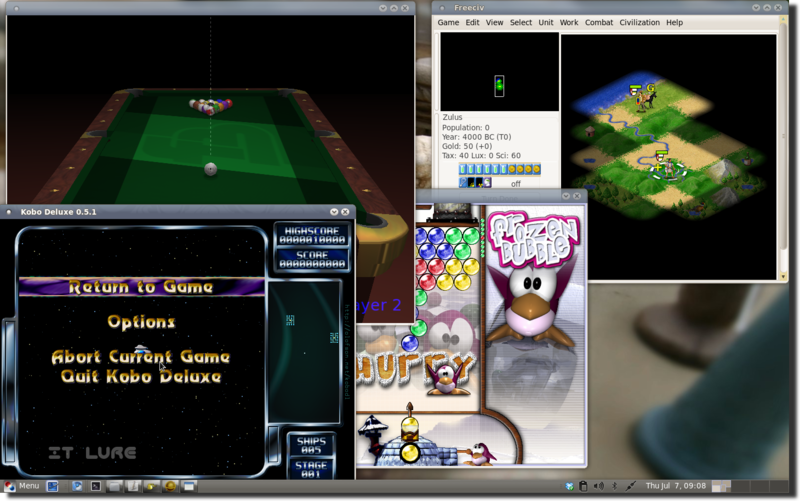 There's also FreeCiv, FooBillard or TeeWorlds (EXTREMELY fun multiplayer; plus, the servers are almost always populated). Graphics: Blender, Fotowall (great photo collage app), PhotoPrint, PosteRazor (for printing a lifesize Justin Bieber using only A4 sheets), Scribus and GIMP. As the "preferred" browser is surely Chromium (it's in the launcher), there is also Firefox 4.0.1 available in the Internet category, next to apps like Empathy (I still want Pidgin! ), Thunderbird, TeamViewer (best remote desktop access), Uget, aMule, etc. LibreOffice holds the office monopoly on its respective category, so nothing too interesting around here. The Sound & Video entry is sustained by names like Avidemux, Pitivi (OpenShot could've easily replaced these two), Audacity for audio editing, Audacious for lightweight music listening, Banshee for a more complete experience, Miro for content discovery, VLC and Handbrake for digitizing your film collection. 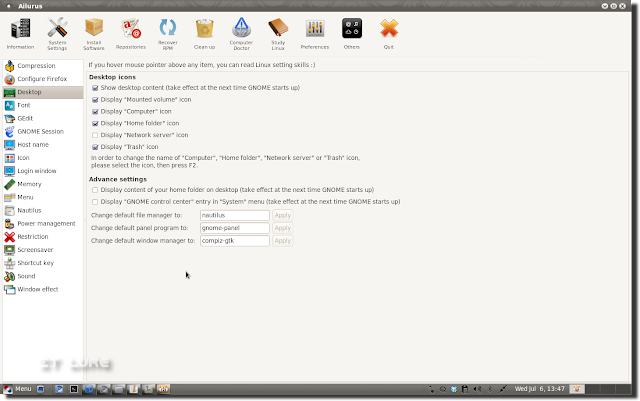 Ailurus sits boldly on top of the System Tools stack, and with good reason, cause it lets you turn all sorts and knobs and switches to customize your GNOME desktop just the way you like it. There are two backup programs: Deja Dup and Nepomuk, THREE terminal emulators, THREE disk usage analyzers and, surprisingly, only one partition manager: GParted. :) For Windows-dependant applications, Wine was also pre-installed and will, hopefully, enable you to work with them sans the tedious dual-boot. What I didn't like was the bad default choices for opening file formats: movies in Banshee (which crashed when I did that. a lot.) and .pngs in PhotoPrint (instead of ViewNoir). Adobe Flash and Java came preinstalled with the system. Setting up my Canon MP250 multifunctional in Fusion Linux was the easiest of all other distros I've tried since I bought it. It fetched the driver automatically and also what I think to be a custom PPD, because I now have a bunch of options that are not available in Canon's official Linux driver. Well done, Fusion, very well done! My multimedia USB keyboard works flawlessly as well. My camera, my Galaxy Mini, USB sticks, USB card readers, all were quickly and correctly recognized. Sadly, while all of the above make for a darn impressive distro, there are two MAJOR issues that pretty much spoil the good parts: no 64-bit and no PAE kernel, thus no more than 3GB for you; and my wired Internet connection simply dies after a couple of hours spent inside Fusion and when it works, it's still kind of flaky. I have no idea why. Download Fusion Linux here or as torrent. Full of fun, humour and still tons of useful information! Do you actually like Fusion the way to keep it installed? Thank you for the kind words! 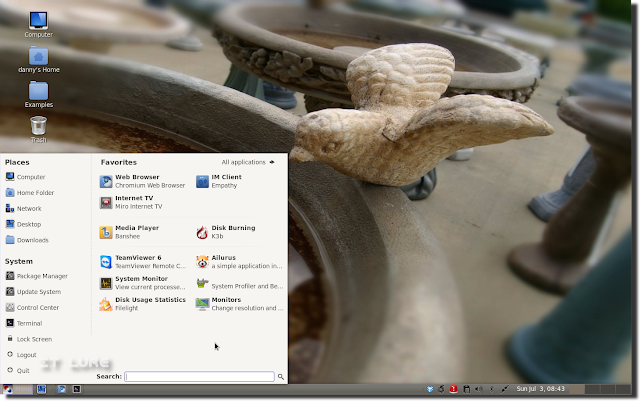 Sadly, until I get to the bottom of the dying Internet annoyance, I just can't use Fusion as my main OS. Another not-so-important-for-me downside is the fact that I can't use all of my 4 GB of RAM. It's not important because I really don't do heavy-duty tasks which require that amount of memory. But, all in all, Fusion is a great distro. i like this distro, is a revamped version of fedora 14, with some improvements. if you like to use all of 4 gbs, you must install kernel pae from repository, it will solve this annoyances. Thank you very much! :) One down, one more to go!